Cancer-associated gene 1 protein (CAGE1) is initially identified as a cancer/testis antigen. CAGE1 is mainly a nuclear protein that displays high expression in testis among normal tissues, and wide expression in various cancer tissues and cancer cell lines. CAGE1 may be associated with tumor progression, while the exact function of CAGE-1 is not well understood. 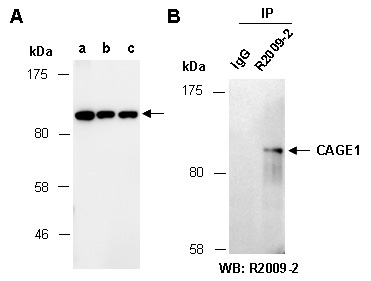 Rabbit polyclonal antibodies were produced by immunizing animals with a GST-fusion protein containing the C-terminal region of human CAGE1. Antibodies were purified by affinity purification using immunogen. (R2009-2), followed by WB with the same Ab.